Whether you have ran an email marketing campaign for some time and are running out of email content ideas or you are new to email campaigns and aren’t sure what type of email content to use, you’ll find these ideas offer a great way to expand your reach, keep your current subscribers, along with obtaining new subscribers. Your goal is to generate leads from your site by offering visitors relevant content. You must always have in your mind the question “What’s in it for me?” That’s what visitors are always asking themselves before signing up for what you have to offer. Your job is to make sure you are offering something that answers that question in a manner that will have your visitor subscribing. 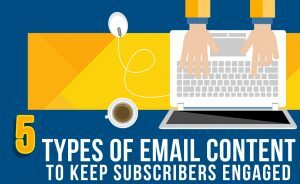 Types of email content you can offer are numerous. Here are 5 types of email content to hook your visitor. 1. E-book or whitepaper – Create around six blog posts that discuss a similar topic(s) and then combine them to make yourself an e-book or whitepaper. Depending on the length of the blog, you might need more post. Feel it out as you go. 2. How to Guides – People want to know how to accomplish all kinds of things. All you need to do is create a simple guide for your visitors that they can download. For example, perhaps you sell an analytics product, and then create a guide on how to effectively use this kind of product. 3. Top Industry Trends – This could be the top 5, top 10, etc. whatever you have to work with. Write a quick introduction on these new developments in your industry and write about these developments telling the reader what you think about each of them. 4. Create a video of the product – Videos have become very popular and at no time has it been easier for anyone to upload a video and then share it with the customer and prospects. Create a video showing all the features of your product, how to accomplish a specific goal, or whatever else. Then use that video to have them move forward in the sales funnel. 5. Checklist – You can create a checklist that is made up of steps that your visitor can use to solve a specific problem. For example, if your visitor is looking to use Facebook pages, you could create a checklist that walks them through the process. You now have five types of content you can use to engage your visitors and have them commit to being a subscriber. Why not give them a try?